These mechanical conveyors are ideal for vertical or angled conveying of a wide variety of products, even fragile, fibrous or cohesive ones. High throughput & total batch transfer. Our Aeroflow aero mechanical conveyor has a tubular design where a cable assembly, with evenly spaced polyurethane discs, move at high speed. The cable assembly runs in specially designed sprockets at each corner and each end of the conveyor. The action of the cable assembly traveling at high speed creates an air stream running at the same velocity. As the material is fed into the airstream, it is fluidized and conveyed to the outlet where it is centrifugally ejected. "What you need to move through the equipment is your business, keeping it moving is ours!" One of our qualified representatives will respond to you within 24 hours. Our dedicated team of experts is commited to helping you move what matters. As the leading provider of aero mechanical conveyors, Spiroflow has provided these conveying systems operating throughout the world. All conveying takes place in a totally sealed tubular system which ensures the dust-free transfer of even the finest powders. Aero mechanical conveyors can convey materials at any angle from 0° and 90° without loss of capacity. The range of configurations is almost limitless. This enables the widest choice of system layout options, using standard components, to optimize available factory space. Aero mechanical conveyors can be supplied in a variety of configurations enabling them to transfer materials vertically and horizontally within the same unit. These conveyors can also be linked together allowing one aero mechanical conveyor to feed another. Because of the total transfer capability of aero mechanical conveyors cleaning is not necessary for most applications. To avoid cross-contamination of product it is often sufficient to simply purge the conveyor with a sacrificial quantity of material. Safety interlocked cleaning/inspection hatches can be fitted to both the conveying tubes and the sprocket housings. Additionally, aero mechanical conveyors fitted with wash gates and drains can be washed through with water or another cleaning fluid. Aero mechanical conveyors can operate at speeds up to 36 ft3/min or 2,160 ft3/hour / 1 m3/min or 61 m3/hr, with many products such as flour. They are capable of conveying rates in excess of 160,000 lb/hr / 72,600 kg/hr but this rate will vary according to the bulk density of the product. Virtually all materials can be conveyed in an aero mechanical conveyor ranging from the finest of powders to granules, pellets, flakes, and flocks. We have been particularly successful with titanium dioxide which is a notoriously difficult material to convey. Pound for pound conveyed, aero mechanical conveyors are one of the most efficient conveyors available. Users benefit by their minimal power requirements and associated energy savings. Materials are suspended in a cushion of air within the conveying tube as it is displaced by the discs traveling at speed. This makes for a gentle conveying action that minimizes damage to fragile finished products. Spiroflow aero mechanical conveyors can readily be mounted on a wheeled frame complete with controls and a power connection. This makes it possible to use one conveyor to serve several processes or to remove it to a remote wash-down area for cleaning. Optional height adjustment on mobile units is also available when they have to pass under low doorways or when they must discharge at differing heights. Given that product is metered into aero mechanical conveyors at a controlled rate, there are almost identical amounts in each pocket between the discs. The conveying action itself is gentle and therefore tends not to disturb mixtures. The combination of these two factors means that the integrity of mixtures is maintained during conveying. With an aero mechanical conveyor no additional air is added to convey material so there is no excess air at the outlet to filter for dust. Any material that is not ejected at the outlet is simply carried around the enclosed system until it is. It’s simple. What is fed into the conveyor at the inlet is discharged at the outlet. This makes the aero mechanical conveyor ideal for transferring pre-weighed batches of bulk and/or minor ingredients. The concept lends itself to multiple outlets so that one conveyor can deliver material to a series of silos for example. Multiple inlets are possible as long as only one is operational at a time. Our aero mechanical conveyor has a tubular design where a continuous wire rope assembly with accurately spaced polyurethane discs move at high speed. At each end of the conveyor, the cable assembly runs around specially designed sprockets, one of which drives the cable assembly and the other tensions it. The drive assembly can be located at either the inlet or outlet of the conveyor depending on its length or to meet plant requirements. The action of the cable and disc assembly traveling at high speed sets up an airstream running at the same velocity. As material is fed into the airstream, it is fluidized and conveyed to the outlet where it is centrifugally ejected. High capacities are possible with low energy requirements and with minimal product degradation and separation. Aero mechanical conveyors are designed for a variety of applications. Consistent performance and operational reliability have endeared our aero mechanical conveyors to a wide audience of industries. From the seemingly simple task of transferring food ingredients to the abrasive and corrosive nature of conveying chemical industry products, Spiroflow aero mechanical conveyors are well-equipped to handle many kinds of products with ease. Aero mechanical conveyor designed for handling titanium dioxide – one of the few effective methods of handling this type of product. Inclined and horizontal aero mechanical conveyors feeding additives to either of 2 tanks. Aero mechanical conveyor elevating material from a transition hopper fed by two bulk bag dischargers via flexible screw conveyors. Mobile aero mechanical conveyors are used extensively both in and out of factory environments. No bulk handling tasks are more arduous than in mineral and ceramic applications. Spiroflow equipment is robustly built to meet the most exacting demands. Can be used with extremely fragile materials such as tobacco, coffee beans, pelletized fertilizer, etc. Check out our Conveyor Comparison Chart. This document compares our conveyor offerings based on application suitability, configurations, specifications, options & cleanability. Our engineers will assess your application needs & recommend the optimal conveyor system. Some of Spiroflow’s basic aero mechanical conveyor configurations are shown here. Many other layouts can be designed to meet customer requirements. Aeroflow Aero Mechanical Conveyors are offered in 3 sizes. Inlets can be fitted with baffles, lids, hoppers, agitators, etc. For your reference the following table displays a list of components available for our aero mechanical conveyors. Our engineers will evaluate your requirements and make a recommendation for a complete conveying system. All cables used in our cable assembly are constructed from MIL-spec aircraft quality steel cable. The cable assembly is a multi-strand steel cable with one-piece molded discs secured at fixed intervals. Discs Polyurethane Construction: 175°F (79°C) max. Motor selected based on application requirements. Inlet Support A carbon steel (mild steel) or 304 stainless steel floor mounted support base for the inlet housing. Corner Housing A twin housing assembly enables a 90° bend of the conveyor which allows quick access to the corner and/or discharge housing and sprocket. Hinged Housing Access Covers This allows quick access to corner and/or discharge housing and sprocket. Hinged Inlet Chute Access Covers This allows quick access to the inlet housing and sprocket. XP Switch For the Americas: A NEMA 7 switch can be provided for use with the hinged access covers in place of the standard NEMA 4 switch. Inlet Vibration Electric or Pneumatic: Used to aid the flow of materials that can bridge in the hopper. Tube Mounted Inlet Used to introduce product to the air stream via the tube instead of or in addition to the inlet housing. Tube Mounted Outlet Used to discharge product from the air stream via the tube instead of or in addition to the discharge housing. Tube Valve A pneumatically operated slide gate valve can be connected to the conveyor tube outlet. Extended Capacity Chute An extended capacity chute can be supplied with a square grid and support frame. Dust Hood Assembly Dust hood and plastic strip curtain with vent connection can be provided for use with the Extended Capacity Chute. Splash Guard A rear and side perimeter guard for the Extended Capacity Chute can be used to prevent the spillage of material when not fitted with a lid. Lid for Inlet Chute A lid with an inlet and a vent connection is available. Pneumatic Inlet Baffle A pneumatically operated inlet baffle aids in control of product into the air stream. Rotation Sensor Assembly A Zero Speed Switch assembly can be mounted on the slave shaft to detect the motion of a non-driven sprocket and the switch monitor. Air Purging for Housing These Introduce a burst of air into four (4) points positioned inside the housing to remove the presence of any product accumulation. Level Indicators A capacitance sensor can be mounted through the side of the chute/discharge to indicate a low and/or high solids level. Mobile Base Carbon steel (mild steel) or 304 stainless steel frame support can be provided with casters and support for the complete conveyor. Wash Gate Drain The unit is provided with a shut off gate for isolating the system for complete Clean-In-Place. Grounding Lug System Conductive equipment can be inter-connected to keep the same potential between parts and prevent sparking. Patented Dynamic Automatic Rope Tensioner The automatic tensioner applies a constant pre-load to the conveyor’s cable and disc assembly & compensates for the natural change in length of the cable during its life cycle. A pneumatic actuator, anchored at one end, applies a linear force to the free moving aero mechanical housing mounted on 2 linear bearings fitted with ‘O’ ring seal assemblies where it interfaces with the 2 conveyor tubes. A manually adjustable precision filter regulator is employed to ensure that there is never too much pressure applied to the actuator and this limits the linear force (tension) applied to the conveyor. The pneumatic circuit prevents the total loss of linear force and tension if the air supply is interrupted. Patented Dynamic Automatic Rope Tensioner (Bottom Mounted, Includes Support Frame) The automatic tensioner applies a constant pre-load to the conveyor’s rope and disc assembly & compensates for the natural change in length of the rope during its’ life cycle. A Pneumatic Actuator anchored at one end applies a linear force to the free moving aero mechanical housing mounted on 2 linear bearings fitted with ‘O’ ring seal assemblies where it interfaces with the 2 conveyor tubes. Clean dry plant air at a minimum pressure of 60PSIG is required for reliable operation. Controls Control panels can be provided as per customer requirements. This document compares our conveyor offerings based on application suitability, configurations, specifications, options & cleanability. Our engineers will assess your application needs & recommend the optimal conveyor system. 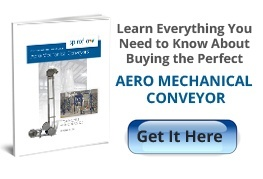 Aero mechanical conveyors are sometimes compared to pneumatic conveyors; learn about the differences and similarities. Almost all materials can be conveyed making the aero mechanical conveyor the ideal medium for transferring products from the finest of powders to granules, pellets, flakes and flocks. The tables show estimated conveying rates in tons per hour based on continuously metered feed. When feeding from a bag dump station the rate may reduce by 10% – 40% depending on material flow characteristics. Aero mechanical conveyors can transport a multitude of materials. Here is a very short list of materials generally considered for this type of conveyor. Our engineers will carefully assess the properties of your material and likely perform a material test to ensure your conveyor performs exactly to your expectations.